When traveling, I love to try new foods. I especially like trying a place’s street food. Local, and cheap it’s a great way to get to know a place in a different way, and Cartagena is no exception. Street stalls are common and offer up a number of delicacies. In this guide to street food in Cartagena we are going to look at the best of them. So read on to learn the 15 street foods you should try in Cartagena. Street food stalls can be found throughout Cartagena. You can also find vendors riding bicycle vending stations, push carts, or even walking around selling a variety of different foods. They are particularly popular among cartageneros for breakfast, mid-morning or mid-afternoon snacks, and for dinner on the weekends. Cheap, plentiful, and with a decent variety (if not so healthy), Cartagena’s street food has to be tried. 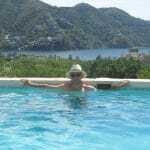 In this post, I will be looking at the 15 street foods worth trying in Cartagena. I hope you enjoy the read and more importantly enjoy the food! The arepa de huevo is practically an institution in Cartagena. Thicker than your average arepa, it is stuffed with egg and ground beef. For you vegetarians, you can ask for it without the meat. It’s a popular Cartagena breakfast on the go, and with lots of grease a pretty good hangover cure as well. The arepa de huevo is also a great mid-afternoon or late night snack. They can be bought from mobile vendors or, even better, from street side fry stalls. 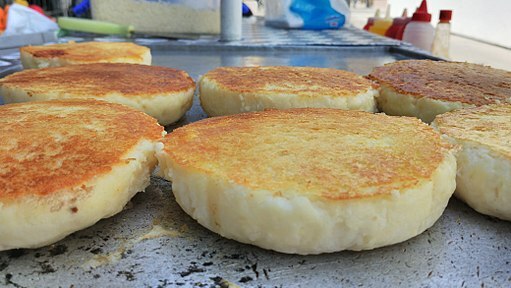 Some of the best arepas de huevo can be found being fried up fresh on the corner near the Exitó San Diego supermarket in San Diego or from the Plaza San Diego. If you want to sample variations, check out Donde Magola, just around the corner. They have a number of alternative fillings, including chorizo, chicken, and even shrimp. My personal favorite is the one with chicharrón. Distinctive to the Colombian Caribbean and a unique spin on this traditional Latino food item, the arepa de huevo is a must try in Cartagena and easily tops our list of the best street food in Cartagena. *If you happen to be visiting Cartagena in late January, you should check out the annual Festival del Frito, a celebration of the Arepa de Huevo. See our Guide to the Festival del Frito Cartagenero. Carimañolas are also distinctive to the Caribbean (hence the cari…in the name) and are popular in Colombia and Panama. 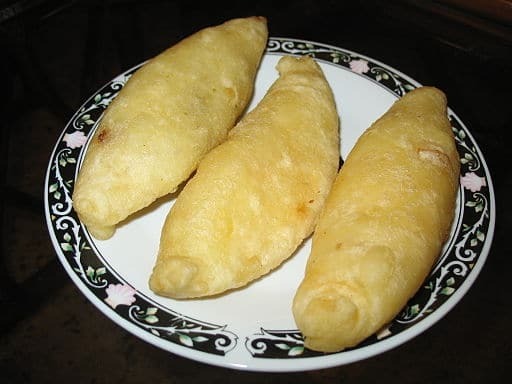 Similar in look to empanadas, they are fritters made from yuca, aka cassava. 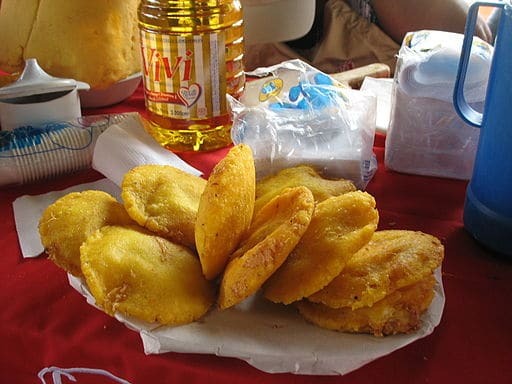 Like the arepa de huevo this Cartagena street food is also popular both for breakfast or as a snack. The yuca is boiled and mashed before being formed into cylinders. They usually have a ground beef or cheese filling. Once formed, they are fried. The best ones will be crispy on the outside while soft and mushy on the inside. Some people like them with suero, a homemade sour cream that is a popular dipping sauce with locals. Butifarra is a sausage that originates in Catalonia, Spain. Made with pork meat, spices, and brown sugar, butifarra in Colombia has its own particular taste and is especially associated with the Caribbean coast in Cartagena and Barranquilla. It is usually eaten as just a snack, not a meal in and of itself. You’ll find butifarra from vendors walking around with a big pot or bucket and banging a knife on it. Be sure to enjoy it with some lime. You can also get packaged butifarra in the supermarket and it is often included as an ingredient in a few other things, including pizza and fast foods like number 5 below. Donde Magola even has an arepa de huevo with butifarra. Patacones are smashed, double fried, green plantain patties. They are almost like a big, thick plantain chip that is crisp on the outside and soft inside. They are a common side dish and are sometimes eaten alone as a snack with some cheese and/or suero. There are vendors near the Parque Fernandez de Madrid that sell this classic Cartagena street food snack. For this Cartagena street food dinner dish, a bigger, longer patacón is used. It is the base for a heaping pile of todo (everything). What is that everything? It is at least chicken, chorizo, butifarra, and cheese. Depending on the stall, they may also add shredded beef and/or pork. On top of all that are crispy potato sticks and a full complement of sauces. Patacón con todo makes for a tasty and filling dinner or late night snack. The vendors at the Plaza de la Trinidad in Getsemaní serve up some great ones. Now that we’ve talked about several fried foods, 1 sausage, and 1 plate that combines the two, perhaps we should consider something a bit healthier. There are tons of great fruits available in Cartagena. Around the walled city, you will see vendors selling them, including the women in bright dresses known as Palenqueras. Many even sell mixed fruit cups. Some to try include mango biche, green mango with salt and lime juice, watermelon, pineapple and papaya. When in season, ciruela and mamón are also interesting local favorites to try. You can also find stalls making fresh fruit juices. Cartagena has terrific seafood, including the shrimp cocktails you can get at stalls on the street. They serve them with a mix of onion, garlic, lime juice, ketchup, and mayonnaise. You can also opt to get other shellfish like caracól (snail) and chipi chipi (a small mollusk) mixed in. Or you can get it as a ceviche with only the lime, garlic and onion minus the sauce. 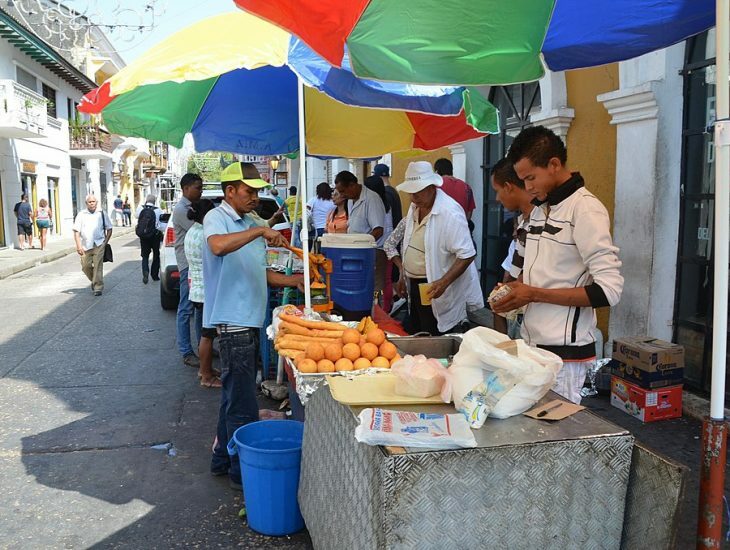 There is a cluster of stalls on Avenida Venezuela just outside the walled city. The best is the one under a giant hat. There is another good stall across from Parque Centenario across the street from the Clocktower. There are also usually vendors on the beach. Grilled arepas are another popular street food in Cartagena. You’ll see lots of grilled arepa vendors in most cities in Colombia. Using white corn meal and stuffed with cheese, you will see them grilling them up in Cartagena as well. They are salty, gooey, and filling. I have to confess, I’m actually not a big fan. Honestly, I just don’t like the smell. However, I know lots of people who love them. Therefore I felt like I’d be remiss to not include them on this list of Cartagena street food worth trying. I know that wasn’t exactly a ringing endorsement, but you should check them out for yourself. Papa rellenas are big, deep fried balls of mashed potatoes filled with ground beef. They make for a very filling breakfast or afternoon snack. They’re more proof that meat and potatoes is a universally loved combo. Although the papa rellena originates from Cuba (or Puerto Rico depending on who you ask) and are a common sight throughout the Caribbean, they’re too good not to include on this list of the best street food in Cartagena. If you want an especially tasty one, see if you can find one that has egg and ground beef. Pinchos are simply meat on a stick. You can find vendors grilling them up near the Clocktower as well as on the street in Getsemaní at night time. You’ll find pinchos with beef brushed with a sweet sauce, chicken, or a chorizo and butifarra mix. They are normally topped off with the small potato known as a papa criolla. Quick and easy to eat they make for a great Cartagena street food snack between places while barhopping. How to properly describe peto? It’s a drink made from dried white corn with cinnamon and brown sugar and served warm. It’s sweet but also kind of hearty, oatmealy. I guess it seems contradictory that it’s so popular among locals in a place where it is so hot since it seems like it’d be perfect in the cold. But many cartageneros love it. A bit strange, it definitely qualifies as one of more unique street foods to try in Cartagena. You can identify the peto vendors riding around on bikes with a giant pot to keep it warm. Bollos are steamed rolls of mashed corn. You’ll recognize them wrapped in the corn leaves. While they are often sold to be taken home, there are vendors who will serve them to you along with cheese. This is a local favorite. The bollo is cut up into little pieces and has a sweet taste almost like corn bread. There are a number of other variations of this street food worth trying in Cartagena. Bollo limpio is made with white corn and is often served as a side dish with grilled meats. There are some with coconut, called bollo con coco. You can even get bollo de yuca. Ok, I know what you’re thinking, really, a hot dog? Hear me out. While I’m not sure if this is something distinct to only Colombia, the hot dogs here are certainly different than any I ever had in my home country of the USA. They are topped off with cheese and crunchy potato sticks. Finally, a full complement of sauces are added on top. Those sauces include ketchup, mustard, mayonnaise, pink sauce, and even a pineapple sauce. I’m not the biggest fan of the pineapple sauce, but it’s definitely unique and lots of people love it. I’m not sure I would say they really compare to a Chicago dog or a southern chili and slaw dog, but Colombian hot dogs are pretty darn good for a cheap dinner or late night snack. All vendors that have a grill should have hot dogs. They usually come in three sizes, which are, from smallest to largest, sencillo, americano, and suizo. You can also get a chorizo dog or choriperro. 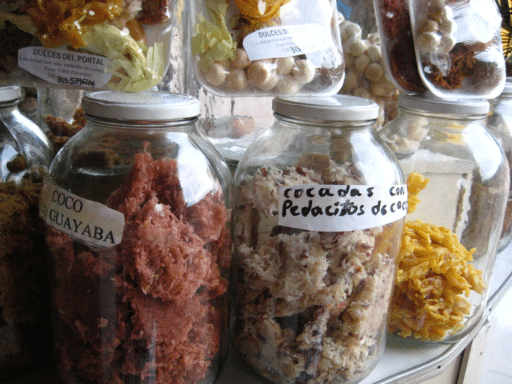 Cocadas on display at the Portal de los Dulces. To close this list of the best street foods in Cartagena, I’m going to give you two sweets. The first is the cocada. These candies are little patties made from shredded coconut. There’s a saying that someone who hasn’t tried a cocada doesn’t really know the Colombian Caribbean. There are a number of different varieties of this sweet Cartagena street food. The “regular” is made with panela, unprocessed brown sugar. The cocada de leche (milk) and cocada de arequipe (caramel) are also popular. You can even get them with a number of different fruit flavors added, including strawberry, guava, and pineapple. You can buy a cocada from women on the street, including the Palenqueras as well as from the stalls in the Portal de los Dulces in the arched walkway across from the Clocktower inside the walled city. Raspao is a snow cone. Elegantly simple, they bring back memories of childhood. What’s cool about getting one in Cartagena is that most of the vendors still use old, antique, hand powered machines to shave the ice. Besides the historic machines, the addition of condensed milk makes for a unique twist to this simple, hot weather classic. A raspao is the perfect Cartagena street food antidote to the hot temperatures. 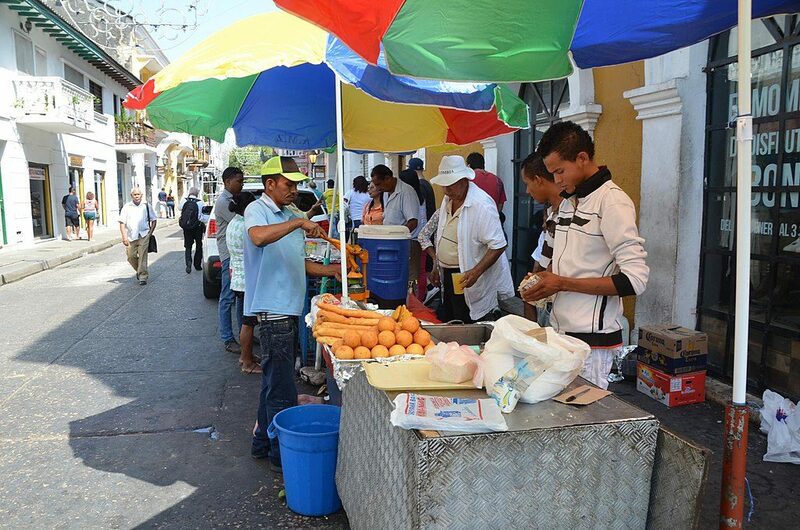 Grab one in the plaza in front of the San Pedro Claver Church as a way to cool off after exploring the walled city. There you have it the my 15 recommendations for the street foods you should try in Cartagena. I hope you enjoyed and this hasn’t made you too hungry. Have another great Cartagena street food you tried? Let me know about it in the comments below. Otherwise, happy eating! Want to learn more about Cartagena’s food scene? Check out our article on the local favorite foods to try in Cartagena. If you will be in Cartagena in late January or the start of February, check out the food festival where you can sample several of the items on this list. See this guide to the Festival del Frito. Ready to plan your street food sampling expedition?